For use in Berkey Light, Big Berkey, Royal Berkey or Go Berkey. These purification elements can produce 4 gallons of clean water each hour. 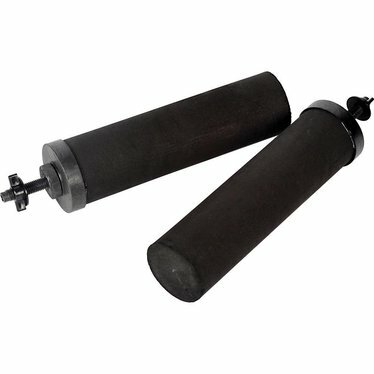 Set of 2 element lasts up to 6,000 gallons. Note: These products cannot be shipped to Iowa because of certification regulations. We live offgrid, and have a well. We have used our Berkey going on five years and have never had a problem with the filters. I just ordered New ones and hope they will do well. My sister and Bruce purchased Berkys as well and love them. They both live in Flint, Michigan. I have 2 Berkey Filter systems. One is used for raw water and the other for city water. After 3 years I had to replace the filters. Now my systems are running as good as new and I am back traveling the country - Thanks. Bought 2 black berkey filters, both separated from the bases, allowing contamination of the lower chamber. Won't buy Berkey again. Also, Lehman's did not live up to their guarantee, and would not exchange or refund. I know they have lots of customers, but they have one less now. Our filters also came apart after about 4 months of use when I cleaned out the upper tank. My husband bought a silicone epoxy product from the hardware store that was clearly labeled for potable use. It resealed the filters very quickly and we will see how long this lasts. We use our Berkey in a vacation cabin, so it does not get continuous use. Our well water is very hard with a lot of iron, so the filters do an amazing job on purifying the water to make it drinkable and pleasant. Before, it had a very metallic taste and was discolored. The Berkey was worth every penny. It is a shame the filters are not sealed better to withstand time. We bought our Berkey Light with our first George W. Bush rebate check. We just received our third set of black element filters. My husband keeps our filters cleaned with a fresh green scrubbie. We will keep you updated after we try the new set of filters. We love our Berkey Light!!!!!!!!!! they are too fragile; after about four months use, one separated from its base and I saw the silicone adhesive/sealant was not fully applied so the element came loose. This product is great. Our water is horrible to say the least but with this Berkey we have good tasting water. As with so many products, the construction seems to have been downgraded. These filters are somewhat fragile. They are now made without the rounded edge on the top which makes them even more susceptable to breakage. If you fill the filter with a hose, be sure not to let the water run directly on the element as they do erode. I bought a pair of the elements and built my own 'big berkey' using plans at http://www.alpharubicon.com/kids/homemadeberkeydaire.htmWe have a cabin on 20 acres of forest in N. Wisconsin. Rather than deal with the expense of a well, we now have begun collecting rainwater and filtering it using this homebuilt filter. As a test, I took 5 gallons of stagnant frog pond water, ran it thru a sheet into another bucket to remove bugs and tadpoles and other large things, then dumped it in our homemade berkey. Crystal clear, delicious drinking water was the result.Highly recommended. If you don't care about the cosmetic end of things, build your own. If you want something prettier, buy the 'official' Berkey.